ScrapAli: Wife, Mom, and Scrapbooker! : It has been a crazy week! We decided that we would throw an impromptu yard sale this morning so we have most things that are my blog sale in our front yard right now. We are also in the mist of some major spring cleaning (hints the yard sale). Mag has almost mastered sitting up on her own and I know it won't be long that she will just begin to take off. If her arms would get a little stronger she would so be on the move! In other news I won the free photo session with Ami and Alison Photography during their Easter Traditions Contest. Read my entry: Growing up in Oak Ridge, TN near most of my immediate family brought a lot of family gatherings during the holidays. Each year we helped my "Maw" decorate for each holiday season from Christmas lights to Easter Trees not a celebration was left undecorated. But it wasn't all about the decorations. Every year at Easter the big dogwood tree in her backyard seemed to welcome in the season. And each year on Easter Sunday after going to church and celebrating the resurrection of Jesus Christ we would gather in the back yard for a family photo in front of the dogwood tree. The same year my Maw died so did that tree, but the tradition lives on. 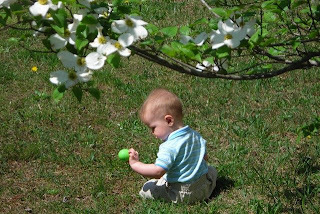 My sons first Easter we were able to find a dogwood tree just a few apartments down from our own here in Cleveland. But last year since Easter was so early we were unable to continue that tradition. I want to find a dogwood tree this year so that my daughter can become a part of that tradition. This is one my favorite childhood Easter traditions that I want to continue for years to come.